This was just released to the PDF subscribers. The print version is live at the Lulu store. Cate Gardner: "Treading the Regolith"
Prolific writer of strange fiction Cate Gardner is well known to readers from many venues, including a previous appearance in M-Brane (issue #3); Deborah Walker has appeared in M-Brane twice previously (issues #5 and #8), in our anthology Things We Are Not, and has stories forthcoming in other venues later this year; Jason Heller appeared in M-Brane #6 and is a regular contributor to The Onion AV Club. 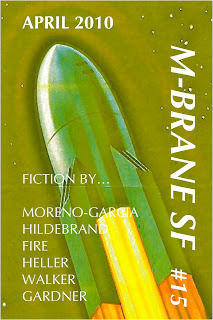 New to M-Brane's pages are Silvia Moreno-Garcia, publisher of Innsmouth Free Press; Erica Hildebrand, fiction writer and Odyssey graduate; and Kaolin Fire, well known to M-Brane readers as one of the editors of GUD Magazine.